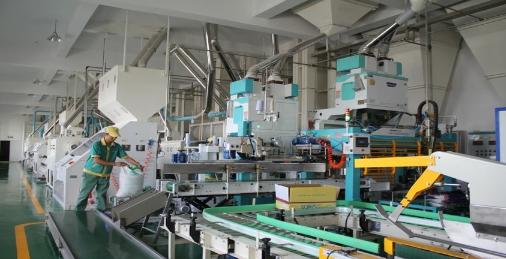 Saiwaixiang Company adopts the company's ten bases, and the base has the industrial development model of the farmers. It has signed 50,000 mu with more than 17,000 households in more than 70 villages in the towns of Yesheng, Jiajing, Shaogang, Xiaoba and Dam. High-quality Rice and 50,000 mu high-quality wheat orders have established a high-quality rice and wheat grain base. Through financial support, supply and marketing services, technology infiltration, information guidance and other means, the scattered agricultural production in one household has been incorporated into an enterprise-based production and management system, which has greatly increased the degree of organization and intensive production of farmers and boosted farmers` income by more than 3.7 million. yuan. According to the plan, Saiwaixiang enterprises will target the international and domestic markets, rely on high technology, and continuously improve processing capacity, and strive to reach the scale of annual output value of 200 million yuan, annual profit and tax of 20 million yuan at the end of the [Eleventh Five-Year Plan", and strive to create ** The trademark and ** have truly become the leading aircraft carrier in the grain industry in Ningxia and even in the grain industry in China.